This ride is an out-and-back mountain climb that consists partially of a fire road and partially of paved public streets. El Sereno Open Space Preserve doesn't contain too many trails, and it features no bike-legal loop possibilities within the park's boundaries. The "primary" trail that runs through the park is Aquinas Trail, and this ride consists of a climb up that trail followed by a descent back over it. There could be some options for making this into a loop (see the bottom of this text) but they all involve increasing the amount of road riding. So, it's safe to say that this version of the ride is the easiest way of trying this trail while maximizing the trail portion of your ride. This is not a ride that would draw riders from significant distances to come and ride here. But, if you happen to live in or around Los Gatos, it's a very decent bike workout you can put in on, say, a weekend morning. I can easily see this being part of the weekly routine of many local riders, especially considering the possibility of starting the ride right from your doorstep. The route represented on this page starts from the bridge where Main Street in Los Gatos passes over Route 17. The assumption is that you'd be using one of the many free parking opportunities in the Los Gatos town center (if you've driven here). There isn't much parking space available at the trailhead of Aquinas Trail and I don't know what the residents think of bikers parking there. I didn't pay attention to (no) parking signs at the trailhead, but the official park map doesn't mark that gate as having parking available. The Suggested Parking link on your left points at roadside parking on the Route 17 overpass itself. Notice that these spaces are limited to two hours of parking after 9:00 AM. There are also spaces available with a three-hour limit in the free parking lots that are less than a block off North Santa Cruz Avenue. It doesn't take long for the climb to start after you leave downtown Los Gatos behind. This paved "approach" portion of the ride quickly becomes its steepest part. When you reach Aquinas Trail, the initial slope of the trail is something of a respite. In fact, during these early parts of the trail, there are even a couple of short segments that are gentle descents that allow you to coast a little. Aquinas Trail starts under the cover of very pretty oak and bay woodlands. As you get higher, it becomes more exposed and stays that way for most of the rest of the climb. This is a wide and fairly smooth fire road from beginning to end. As you get higher, views open up from numerous places northeast to the Santa Clara Valley as well as southeast toward the Lexington Reservoir. Most of the climb on Aquinas Trail is easier than the paved portion of the climb you will have left behind you. To compare with another well-known local trail, this is an easier trail climb than Kennedy Road overall. The only possible exception might be a quarter-mile portion of the trail near the top where the grade stays consistently at or above 15%. Then the last mile of the climb slackens again. This particular route turns around from the junction of Aquinas Trail and Montevina Ridge Trail, which comes at the end of a gentle quarter-mile descent past the highest elevation of the ride, and which also happens to be the spot from which you'd be entering (or leaving) Aquinas Trail if you were to use some of the loop options described below. One way to vary this ride could be to follow the route on this page until you (re)encounter Loma Vista Trail during your descent and take that trail instead back into the street network of Los Gatos. 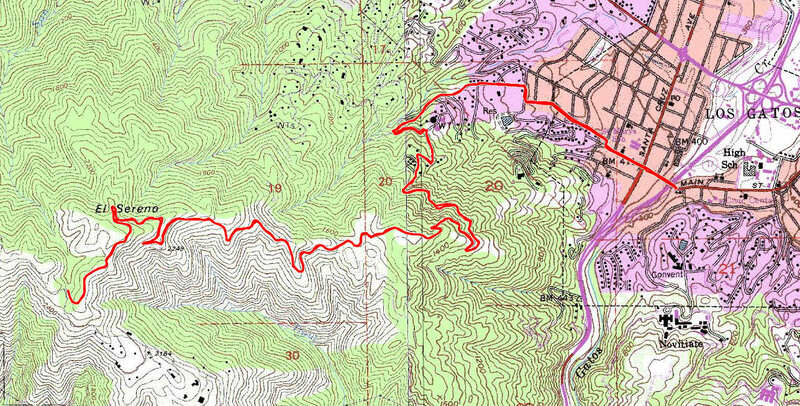 That's about the only meaningful trail-based variation I can think of adding to this route. All other options involve adding more road riding at the cost of reducing your trail-riding time. One such option would be to take Montevina Road up from Lexington Reservoir and riding Aquinas Trail only in the downhill direction. If you start that loop from downtown Los Gatos, you'd be taking Los Gatos Creek Trail up toward the dam, following the singletrack that's along the Old Santa Cruz Highway, and then crossing over Route 17 at the Bear Creek Road intersection. Another option for a loop would be to approach El Sereno from the north over Bohlman Road. But that would increase the road portion of your ride by an even greater amount, since you'd need to be riding on Saratoga Los Gatos Road (Route 9) for about four miles to connect back to the beginning of your loop (not to mention the fact that Bohlman Road is a notoriously steep climb). However, if you really have enough surplus time and stamina, you can also connect this ride to other trail rides at St. Joseph's Hill or Sierra Azul Open Space.